Coconut cream pies are one of those odd things that I didn't mind eating when I was younger even though I didn't really like coconut. I suppose it's really difficult to not like something with that much cream. For some reason or another I have yet to make one. Most likely because I don't typically have the required ingredients on hand. This recipe was different, the mere idea of it made my mouth water. Besides, I already had the coconut, and all the other ingredients are super basic. I was ready and raring to go. I'm trying to figure out how I can relate this pie to the Oscars as that was the weekend I baked it. And the only reason why I want to say anything about the Academy Awards is that for good or bad it was the first time I had watched them in years. Most years I have no idea who won, this year I don't think I had seen any of the movies nominated for anything. Except, maybe, Rise of the Planet of the Apes (awesome!) and that was for one technical award. But my mother loves the Oscars, enjoying the spectacle more than anything else. When I was a kid it was a time for junk food, staying up late, and spending time with my parents. As a grew older, I stopped watching with my parents, and then stopped watching all together. Now that I have moved out, I realize how much I miss those times, and so this year I stayed up late with my parents, ate copious amounts of salty snacks, and waited for Billy Crystal's super tight face to split in two. Oh and earlier that day we ate some pie :). My adjustments to the recipe were quite minor, merely increasing the coconut and salt a tad. Actually, the most significant change was a result of only having fine grated coconut, rather than medium. I hadn't realized this before I started, and it ultimately meant that the pie would have more coconut overall. 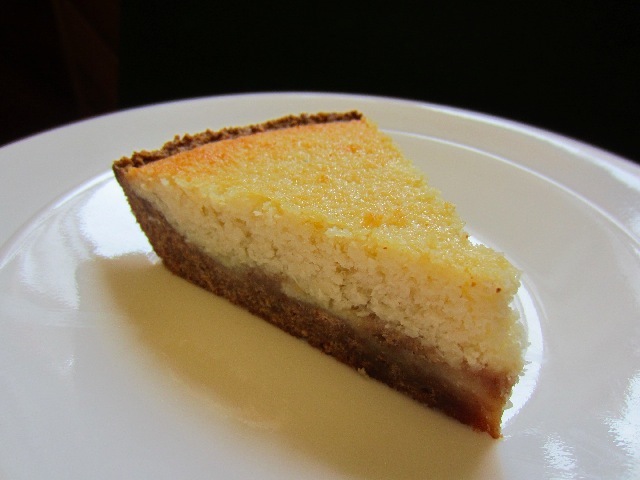 I also went with a graham cracker crust, as I typically feel that custard pies are best with this crust. Not to mention I didn't feel like rolling out pastry :). One of the neat things about this recipe is that there is no prebaking of pie crusts and no tempering eggs. It's pretty much mix, dump, bake. The worst part was the fifteen minutes it took to finally convince myself that the pie crust was even *eye roll*. This pie was probably the most excited I had been for a recipe in some time. The anticipation was killing me; made even worse by the fact that I was going to wait a full twenty-four hours after baking before trying a piece. The pie was, well, confusing. But I'll get to that in a second. First and foremost it tasted fantastic. Exactly as I had hoped. It exploded with coconut flavour and wasn't at all too sweet (making me happy that I once again used unsweetened coconut). But here's the confusing part, texture. The pie had a texture that was more cakey than creamy. Perhaps I over baked it but I think it was the result of the finer coconut. Part of the description in the original recipe mentions a texture kin to a baked creme brulee and maybe that's what this is (I'm not fancy enough to have ever had one). However, judging from the pictures I definitely think it's the coconut. Even the graham cracker crust was very soft and cake like, leading to little texture variance between filling and crust. None of this was bad, just surprising. Overall the flavour of the pie was fantastic and oddly enough, reminded me of the coconut coffee cake I made last year. Strange as that may seem. This is one of those recipes that begs to be tried again. I obviously screwed it up in some way, but the flavour is everything you could want in a coconut pie. It's all about the coconut, unlike a coconut cream, which is more about the cream than anything (not that that's a bad thing). I have listed the recipe as I made it. I'm sure you'll be happy either way you try it. And to help you out with next year's Oscars, one thing's for sure; with no plate or fork required, my cakier un-pie-like version is definitely easier to sneak into a movie theatre :). Add graham crackers to food processor and run and pulse until only crumbs are left, crumble up any larger leftover chunks by hand. Add graham cracker crumbs and melted butter to a medium bowl and mix until all the crumbs are moist. Add crumb mix to pie plate and press evenly on the bottom and up the sides. In a large bowl add flour, salt, and sugar and whisk to combine. Add eggs and whisk until completely combined. Add milk, butter and vanilla and continue to whisk until combined. Pour mixture into prepared pie crust and bake for 45 to 50 minutes or until filling has set (I baked for 45 minutes). Allow to cool completely on rack before moving into fridge to chill for at least two hours. Coconut desserts always looked so pretty in the glass, revolving displays of diners when I was growing up--your looks gorgeous! 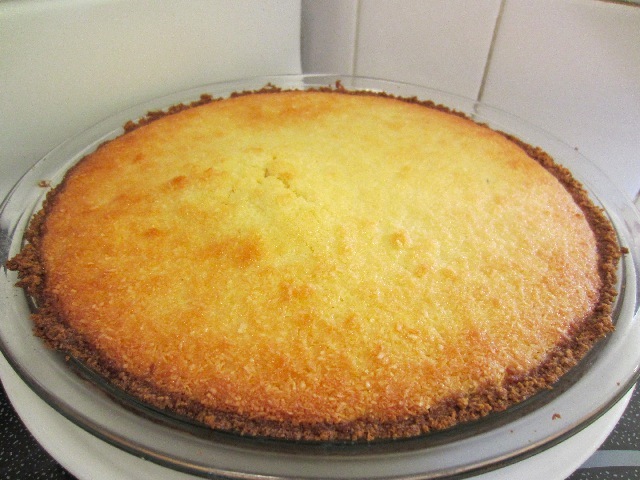 I don't like coconut, so I have never had this type of pie, but I always assumed it was custard-y in texture, and I thought creme brulee had a custard mouth feel as well. Perhaps my assumption about its pudding-like consistency is based more on recollections of silent film pie-fights rather than what the pie should taste like! Yeah, I'm pretty sure it's supposed to be somewhat custardy/creamy, and I really do think that the coconut I used could be the culprit in this case. Though it occurred to me yesterday looking at my image again, that it might have been the crust absorbing the liquid from the pie (look how puffy it is). And I say, give coconut a chance :)... or a second one ... I'm glad I did. I tried drinking coconut milk, figuring that it wouldn't be so bad without the texture, and I had to throw it away. I've never even baked with it because I have such an aversion to it! Fortunately, no one has ever asked me to bake a coconut cake for a birthday! It would kill me to have to sprinkle it on a cake I baked! A friend of mine has a similar aversion to pumpkin and raisins (both of which I love). Pumpkin and raisins? That's just nuts :). Coconut milk wouldn't have been my first stop that screams gag reflex to me :). I unintentionally eased myself into eating coconut by baking it into a carrot cake (I thought I would hate it). I don't know if you've tried, but toasting coconut removes a lot of that weird chewy texture and makes it more crispy. But I would definitely not fault you for sticking your tongue out at it. It's not for everyone :).